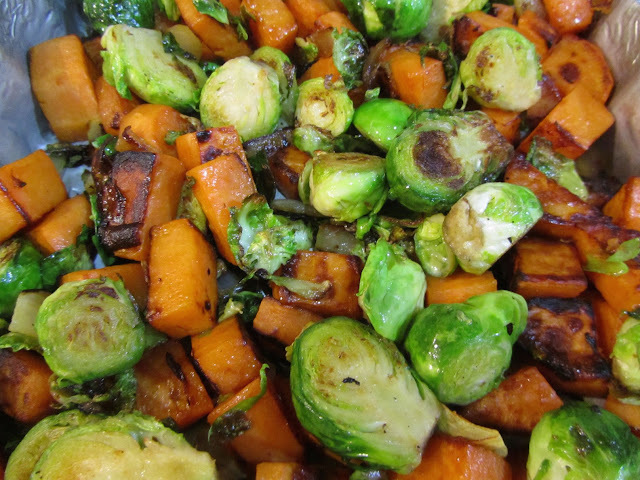 pan-roasted Brussels sprouts and sweet potatoes. It was a delicious week of autumnal foods. The weather turned chilly on Tuesday. I was eating dinner with one daughter and we were talking about the tomatoes in the garden, thinking they should be picked right away. So, we took a break from eating and went out to the garden to pick the rest of the large tomatoes. I'm so glad that we did, because the weather did not grow warmer, only wetter. The Brussels sprouts were on markdown -- such a treat to have! Oh and so were the mushrooms. I bought 3 1/2 pounds of marked down mushrooms. Now I'm getting hungry! Here's what we ate this past week. Anything autumnal on your menu? 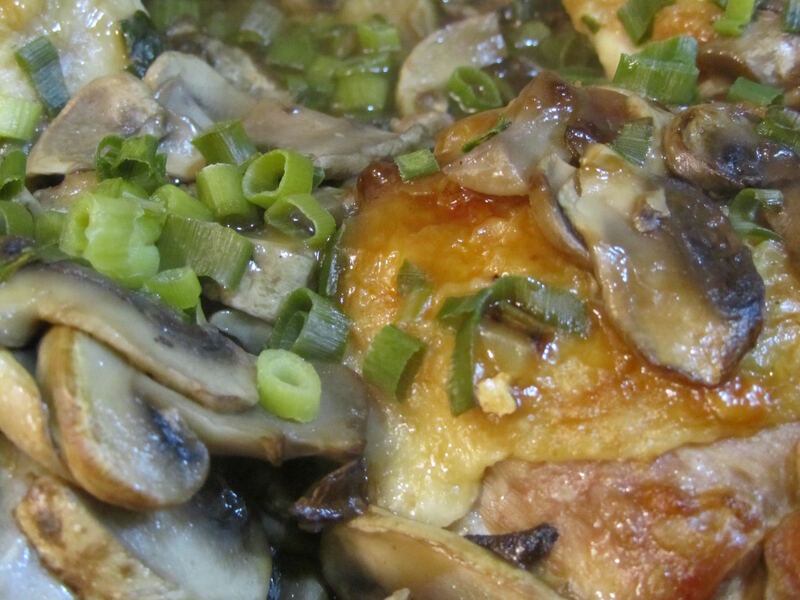 Chicken thighs in mushroom gravy (made double of the chicken and veggies, and froze a dinner for 4) -- I used a mushroom gravy mix, fresh mushrooms, celery, and green onions for the sauce. The gravy mix was 69 cents, a bargain considering it made for a simple meal. update on price of supper -- I decided to add 4 strips of turkey bacon to the salad, extra protein and flavor. That extra adds about 39 cents to the cost of dinner, and 2 grams of protein for each person. For dessert, we also added 4 chocolates from some Dollar Tree boxed chocolates (yes, you can sometimes buy boxed chocolates at Dollar Tree! ), adding about 29 cents, total. The cost per person for dinner, then, is about 79 cents, plus beverages (2 members of the family may have a glass of milk each, the others stick to water; add 10 cents per glass of milk). Under $1 per person for a quick, easy, and fast food-ish meal. Our weather has been up and down--cold one day, hot the next. I have started pulling out my soup recipes and a week ago it was cold enough to make pizza--it bakes at such a high temperature that I only make it when the weather is chilly. Your chicken recipe looks and sounds great! Pizza or soup sound very delicious. I understand waiting to do homemade pizza until the weather cools. I am the same way about using the self-clean feature on the oven. I only do that in cool weather as it overheats the kitchen to do it in warm weather. Have a good weekend, Kris! Yum, I always wish I could come to your house for dinner...then meals sound so delish! It would be so fun if we could have a potluck dinner with all of our blog friends. I bet you prepare some pretty amazing meals, too. It just always sounds better when you're no the one cooking whatever it is. Have a lovely weekend, Saryn! One of my weaknesses is mushrooms. I think they make any meal mouth-watering. Oh those roasted veggies look so good-as does the chicken dinner. Well done! Thank you! The veggies were fantastic. I will do those again this fall. Wow! Your meal plans and pictures look amazing! We have been doing a lot of pressure cooker meals. Pork chops and spinach ravioli cooked all together. Pumpkin spice waffles, eggrolls using the cabbage and carrots from my dad! Froze a bunch of them. Breakfast burritos to make mornings easier. Today is beef barley soup in the pressure cooker using reduced meat we found at the store (more like soup bones). Beef tri tip roast that was discounted has been cooked and is now resting waiting to be sliced. Cabbage and sausage rings was a meal this week. So many things to make using freezer stuff and discounted foods we get at grocery stores. That's the only way to go if we want beef. Normal prices just don't work for us as it is too expensive. Your meals sound delicious, and warming, too! I hear you on beef prices. Last fall I wanted a roast, at the last minute, for a family pot roast dinner and I think I paid about $5 per pound, and felt I was getting a good-enough price, considering it was a last-minute dinner. The beef I bought this week was ground, and I paid $2.24/lb. It was a manager's special/markdown. I bought 6 lbs, and I'm hoping to make it last for two months. I stocked up on chicken thighs at 87 cents/lb. Meat is just an expensive ingredient, so I have to plan for it in the budget more than other items.